AUD 14,284 Excl. Duties / Taxes. This Radiant diamond is 1.8 carat in weight, and comes with Very Good polish and Very Good symmetry, as verified from an independent gemological laboratory. The diamond is graded I in colour, and has a clarity grade of VS2. The diamond's GIA grading report number is 1186935514, which will detail further its specifications and measurements, and will also come with the purchase of the stone. This Radiant diamond is 0.55 carat in weight, and comes with Good polish and Good symmetry, as verified from an independent gemological laboratory. The diamond is graded I in colour, and has a clarity grade of VS1. The diamond's GIA grading report number is 13047925, which will detail further its specifications and measurements, and will also come with the purchase of the stone. This Radiant diamond is 1.02 carat in weight, and comes with Excellent polish and Excellent symmetry, as verified from an independent gemological laboratory. The diamond is graded I in colour, and has a clarity grade of VS2. The diamond's GIA grading report number is 2307504229, which will detail further its specifications and measurements, and will also come with the purchase of the stone. AUD 3,590 Excl. Duties / Taxes. This Radiant diamond is 0.9 carat in weight, and comes with Excellent polish and Very Good symmetry, as verified from an independent gemological laboratory. The diamond is graded I in colour, and has a clarity grade of SI2. The diamond's GIA grading report number is 5192703627, which will detail further its specifications and measurements, and will also come with the purchase of the stone. AUD 23,277 Excl. Duties / Taxes. This Radiant diamond is 2.5 carat in weight, and comes with Very Good polish and Very Good symmetry, as verified from an independent gemological laboratory. The diamond is graded I in colour, and has a clarity grade of SI2. The diamond's GIA grading report number is 1303173160, which will detail further its specifications and measurements, and will also come with the purchase of the stone. AUD 9,856 Excl. Duties / Taxes. This Radiant diamond is 1.5 carat in weight, and comes with Excellent polish and Excellent symmetry, as verified from an independent gemological laboratory. The diamond is graded I in colour, and has a clarity grade of SI1. The diamond's GIA grading report number is 6312277493, which will detail further its specifications and measurements, and will also come with the purchase of the stone. AUD 37,489 Excl. Duties / Taxes. This Radiant diamond is 3.11 carat in weight, and comes with Very Good polish and Very Good symmetry, as verified from an independent gemological laboratory. The diamond is graded I in colour, and has a clarity grade of VS2. The diamond's GIA grading report number is 3275635556, which will detail further its specifications and measurements, and will also come with the purchase of the stone. AUD 17,792 Excl. Duties / Taxes. This Radiant diamond is 2.01 carat in weight, and comes with Excellent polish and Excellent symmetry, as verified from an independent gemological laboratory. The diamond is graded I in colour, and has a clarity grade of VS1. The diamond's GIA grading report number is 2207891283, which will detail further its specifications and measurements, and will also come with the purchase of the stone. AUD 14,709 Excl. Duties / Taxes. This Radiant diamond is 1.86 carat in weight, and comes with Very Good polish and Good symmetry, as verified from an independent gemological laboratory. 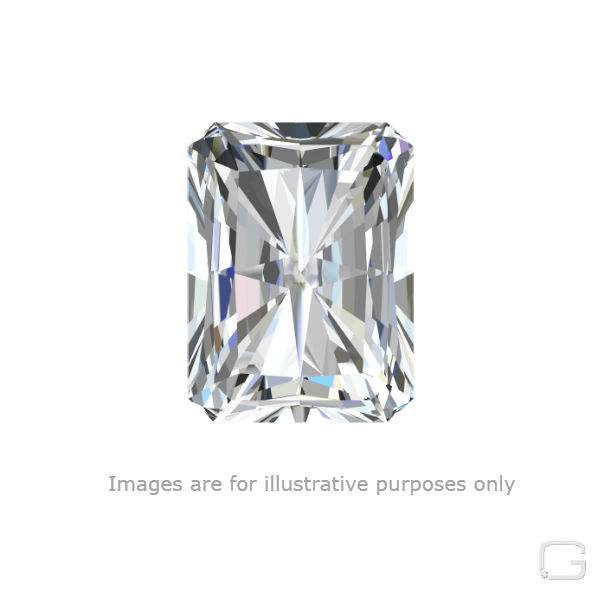 The diamond is graded I in colour, and has a clarity grade of VVS1. The diamond's GIA grading report number is 2105530558, which will detail further its specifications and measurements, and will also come with the purchase of the stone. AUD 8,465 Excl. Duties / Taxes. This Radiant diamond is 1.36 carat in weight, and comes with Good polish and Very Good symmetry, as verified from an independent gemological laboratory. The diamond is graded I in colour, and has a clarity grade of VS2. The diamond's GIA grading report number is 6315105121, which will detail further its specifications and measurements, and will also come with the purchase of the stone. This Radiant diamond is 0.51 carat in weight, and comes with Excellent polish and Very Good symmetry, as verified from an independent gemological laboratory. The diamond is graded I in colour, and has a clarity grade of SI1. The diamond's GIA grading report number is 6193475987, which will detail further its specifications and measurements, and will also come with the purchase of the stone. AUD 4,445 Excl. Duties / Taxes. This Radiant diamond is 1 carat in weight, and comes with Excellent polish and Very Good symmetry, as verified from an independent gemological laboratory. The diamond is graded I in colour, and has a clarity grade of VS2. The diamond's GIA grading report number is 2297985429, which will detail further its specifications and measurements, and will also come with the purchase of the stone. AUD 14,197 Excl. Duties / Taxes. This Radiant diamond is 1.8 carat in weight, and comes with Very Good polish and Very Good symmetry, as verified from an independent gemological laboratory. The diamond is graded I in colour, and has a clarity grade of VS1. The diamond's GIA grading report number is 5313834607, which will detail further its specifications and measurements, and will also come with the purchase of the stone. This Radiant diamond is 1.18 carat in weight, and comes with Very Good polish and Very Good symmetry, as verified from an independent gemological laboratory. The diamond is graded I in colour, and has a clarity grade of VS2. The diamond's GIA grading report number is 5126545482, which will detail further its specifications and measurements, and will also come with the purchase of the stone. AUD 17,082 Excl. Duties / Taxes. This Radiant diamond is 2.03 carat in weight, and comes with Very Good polish and Good symmetry, as verified from an independent gemological laboratory. The diamond is graded I in colour, and has a clarity grade of VS2. The diamond's GIA grading report number is 2195036516, which will detail further its specifications and measurements, and will also come with the purchase of the stone. AUD 3,978 Excl. Duties / Taxes. This Radiant diamond is 1.01 carat in weight, and comes with Very Good polish and Very Good symmetry, as verified from an independent gemological laboratory. The diamond is graded I in colour, and has a clarity grade of SI1. The diamond's GIA grading report number is 1309291462, which will detail further its specifications and measurements, and will also come with the purchase of the stone. AUD 8,562 Excl. Duties / Taxes. This Radiant diamond is 1.51 carat in weight, and comes with Excellent polish and Very Good symmetry, as verified from an independent gemological laboratory. The diamond is graded I in colour, and has a clarity grade of SI1. The diamond's GIA grading report number is 2195081153, which will detail further its specifications and measurements, and will also come with the purchase of the stone. AUD 23,134 Excl. Duties / Taxes. This Radiant diamond is 2.02 carat in weight, and comes with Excellent polish and Excellent symmetry, as verified from an independent gemological laboratory. The diamond is graded I in colour, and has a clarity grade of VS2. The diamond's GIA grading report number is 1149165508, which will detail further its specifications and measurements, and will also come with the purchase of the stone. This Radiant diamond is 0.5 carat in weight, and comes with Very Good polish and Very Good symmetry, as verified from an independent gemological laboratory. The diamond is graded I in colour, and has a clarity grade of SI1. The diamond's GIA grading report number is 5202192818, which will detail further its specifications and measurements, and will also come with the purchase of the stone. AUD 15,980 Excl. Duties / Taxes. This Radiant diamond is 2.06 carat in weight, and comes with Very Good polish and Good symmetry, as verified from an independent gemological laboratory. The diamond is graded I in colour, and has a clarity grade of SI1. The diamond's GIA grading report number is 5172803838, which will detail further its specifications and measurements, and will also come with the purchase of the stone. AUD 17,386 Excl. Duties / Taxes. This Radiant diamond is 2.06 carat in weight, and comes with Very Good polish and Very Good symmetry, as verified from an independent gemological laboratory. The diamond is graded I in colour, and has a clarity grade of SI1. The diamond's GIA grading report number is 5313486404, which will detail further its specifications and measurements, and will also come with the purchase of the stone. AUD 11,885 Excl. Duties / Taxes. This Radiant diamond is 1.56 carat in weight, and comes with Excellent polish and Excellent symmetry, as verified from an independent gemological laboratory. The diamond is graded I in colour, and has a clarity grade of VS2. The diamond's GIA grading report number is 7312978738, which will detail further its specifications and measurements, and will also come with the purchase of the stone. This Radiant diamond is 1.2 carat in weight, and comes with Excellent polish and Excellent symmetry, as verified from an independent gemological laboratory. The diamond is graded I in colour, and has a clarity grade of VS2. The diamond's GIA grading report number is 1258484426, which will detail further its specifications and measurements, and will also come with the purchase of the stone. This Radiant diamond is 0.91 carat in weight, and comes with Very Good polish and Good symmetry, as verified from an independent gemological laboratory. The diamond is graded I in colour, and has a clarity grade of SI2. The diamond's GIA grading report number is 5303374739, which will detail further its specifications and measurements, and will also come with the purchase of the stone.